I humbly thank you for taking the time to view our rustic cabin which truly is off the beaten path, up a gravel road, one way in and one way out an hour North from a small community, the town of Columbia Falls, we invite you to come and retreat from your everyday traffic jams get away from where people cut you off while driving, he’s shaving, she’s putting on her make up while both are speaking on their cell phones causing a trail of tension. Well, take a chance make a change, make a difference, have a memorable life time experience. Come to this quaint rustic type trappers cabin, get the kids away from their TV, video games this summer/winter and back to the family (DO IT NOW)!! YOU WON’T BE SORRY. One mile South of Polebridge in Northwest Montana, in the North Fork Valley which is nestled between the Western edge of Glacier National Park and the oldest mountain range on the continent the Whitefish Range which was formed 75 to 100 million years ago this area is truly where heaven meets earth. As I write I just can’t contain myself I just don’t know where to start, ecosystem as intact as can be, imagine! Free roaming Grizzly Bears, Black Bears, (recommended bring bear spray on all outdoor activities, two if you have a large family) Mountain Lions, Moose, Elk, Whitetail and Mule Deer, Wolfs, Coyotes, they all coexists together the more time you spend outdoors the more you see. Okay, now I’ll get to the cabin just after I tell you about the activities, practically out the cabin door has truly endless activities something for the whole family to enjoy. The view out the front door is Glacier National Park, just minutes away with endless hiking trails pristine remote lakes (Kintla and Bowman) where hiking, swimming, sea kayaking, fishing or just kayak out to have a picnic on one of many lake side locations (please pack your trash out) please leave no trace behind. You may want to raft the North Fork as you fly fish with Glacier in its entire splendor as a back drop, or perhaps a guided raft trip down the Middle Fork of the Flathead River (very fun). As you spend time in the North Fork Valley exploring the sites drive to a couple of hidden lakes Red Meadow, Upper White Fish just to mention a couple. Explore with the family many mountain biking trails the North Fork is a Wild and Scenic designated area, there is something here for every avid explorer that’s in all of us. This wonderful cabin is located one mile South from historical Polebridge Mercantile enjoy the daily fresh baked goods, arts, crafts and antiques. Dine at the Northern Lights Saloon most often in the evenings with live local musician you’ll never want the day to end, we look forward to hearing from you.The Home Ranch Store and Tavern (great barbecue food) is just 3 miles south of the cabin. (This cabin is off the power grid,cabin has power via power Inverter solar & generator as backup). Life long resident of the Flathead valley with ties to the North fork since 1959. Retired Ironworker. cross country and Park trails open in winter for snowshoeing and cross country skiing , short ride to snowmobiling on Forest Service roads in winter. Outdoor Fire Pit, wood furnished, you never know what wildlife you can see right from the cabin!! river rafting, hiking, fishing, bird watching, wildlife, star gazing, photography, and just relaxing. winter activities, snow shoeing, cross country skiing, snowmobiling, and relaxing by the fire. Amazing location. Perfect mountain cabin vibes and John is an excellent host. The cabin had everything we hoped for and then some. I’m a photographer and the view from the lofted deck was 👌�. Thank you John for creating such a great way to disconnect and enjoy nature. I was so excited when I booked this cabin back in February and I was not at all disappointed. It was warm and cozy. It had everything we needed. John called and check on us the first day to make sure we had arrived. We saw grizzly bear 6 out of the 7 days we stayed. We even had one visit the front porch one morning around 6:30and knock the grill off the porch. I could not have been more pleased with our stay, except that it was too short. I did not want to leave. Thank you to John and Sharon for sharing this amazing place with others. We hope to return in the near future. We truly enjoyed the Snell cabin. Everything we needed was provided inside and outside. Only comment would be a bit more light in the cabin. But the wildlife surrounding the cabin was amazing. We watched a momma grizzlie with two cubs safely through his spotting scope. Saw elk while cooking on the porch and deer always around. Woodstove kept us warm and cozy. With much of the park closed because of fire or new snow, we explored the surrounding areas, fishing and hiking high lakes and North Fork and eating bearclaws from the Poleridge Mercantile just up the road. A fantastic gettaway. - It was remote. We could get to the park in 45 minutes, and avoided the hustle bustle of being closer to the park. - The cabin sits in a plain and looks to the mountains....just a spectacular view especially from the loft deck. - it is well equipped, cozy, had a nice little wood stove and plenty of well cured wood. It held the heat well. -BUT best of all was the wildlife. Right from the cabin, we saw grizzlies in the adjoining field 11 of the 12 nights we were there. (we think it was the same 4 grizzlies on alternating nights, a sow and 2 large cubs, and a solitary bear who was turning over hay bales in the fields and eating the oats.) We also saw a falcon or hawk flying over the fields each morning, and there were deer in the field (same time as the grizzlies!) every night and morning. On the Camas Road into the park, we followed a bull moose down the road for about 1/4 mile. And near the Polebridge Mercantile, about 2 miles from the cabin, we saw a moose cow and her calf. On the road into Bowman lake we saw a WOLF!!! It was awesome. -lastly, John Snell and Sharon were a delight and easy to work with. We enjoyed the peace and quiet of this beautiful location. The cabin was well maintained, clean and adequately supplied. John replied to all our questions and was a great resource of information regarding the area. We highly recommend the cabin and location for anyone that needs to unplug from reality. This cabin was just the 'BEST'! It was homey, rustic with all the amenities, warm, comfy and very clean and well cared for. There was no TV and no cell or internet service, which was just perfect for us and our need to totally disconnect. We watched deer in the yard and across the field, everyday, including two baby fawns. It was cold several days, so we enjoyed the wood stove. It was so very quiet, especially sitting out on the front porch, which offered the most amazing views of mountains. And sitting on the upper balcony was a treat too. We would highly recommend this cabin. We hope to bring our grandchildren here some day. They would just love it. Thank you John for your hospitality. Glacier Park to the east and vast Forest Service land to the west. Great for exploring. Cyclone lookout, Cyclone Lake, Red Meadow Lake, Bowman Lake, Kintla Lake, Logging Lake. and lots of Park trails. 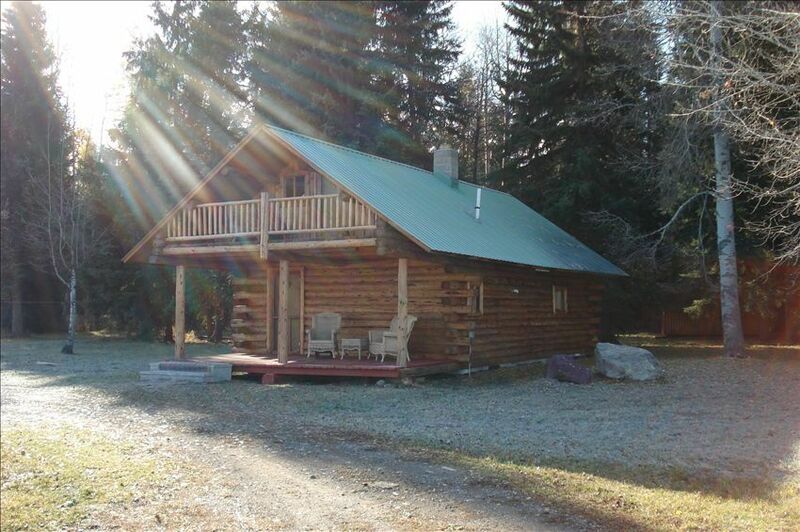 Cabin located 34 miles North of Columbia Falls or 1 mile south of Polebridge. rental season from 1 Jan. to 31 Dec. same rate all year. we try to rent by the week during prime time (1 July to 30 Sept.) but will fill in on either end of a week that is rented.